International Bestselling Author, L. Sydney Fisher developed a love of writing during her childhood years. 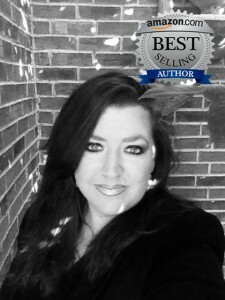 She enjoys writing thrillers and has over twenty years experience in paranormal research. She earned a Bachelor of English from the University of Mississippi and a Master’s in Education from the University of Missouri. When she isn’t writing, she is searching for her next inspiration. She loves research and enjoys studying NASA exploration, military history, ancient history, supernatural wonders, unexplained phenomena, and unsolved crime. You will always find some element of truth in L. Sydney’s books, so be observant. L. Sydney claims to be an unashamed book hoarder, A “Wanna-Be” Indiana Jones, hopeless romantic, history geek, and an undeniable CHOCOLATE addict. She lives in Northeast, Mississippi with her two children and a golden retriever named Willie Wonka. Much of my inspiration for writing comes from research or studies that I am involved in. I have a curious mind. Always seeking answers to life’s mysteries or problems. Anything paranormal or supernatural fascinates me. It defies logic. Unexplained phenomena can be extremely frightening. I have researched the paranormal for almost three decades and I still find it terrifying at times. Other inspirations come from random life experiences that totally sweep me off my feet and cause me to ask if certain life experiences are predestined. Are we really the master of our fate or do we only control a portion of it? Extraordinary life experiences cause us to ask questions. Questions that can be frustrating as we look for answers. I like to build stories around real life circumstances and bring these situations to a cinematic effect on paper. What we experience is very real. How we perceive it, is something completely different. I have been accused of being a neat freak. A super organized person. That’s not totally true, but I do like to plan. A good plan is your pathway to getting somewhere. I ALWAYS have an outline and design of how my story begins and how it ends. The problem is filling in the gaps between chapters by creating the scenes that propel the story forward. I use post it notes, a dry erase board, and each of my projects gets a new, thick notebook with extra pockets for storing research items/articles. A very important factor in my planning process and even after the writing begins is staying flexible and allowing the story or the characters to change as the story progresses. Sometimes, you will get into a project and realize that something needs to be different than you had originally intended. I will admit that I have recently started doing this. Talking to or acting out scenes as my characters. When I saw this question, I was somewhat relieved to know that I must not be “losing it” after all since this was a legitimate question. Actually, acting out scenes as my characters is very beneficial to character development. I would even say that it’s necessary. During my freshman year of college, I was on a full scholarship as a Theatre major. Those years of stage performance really help me at times. I don’t have to tell you that writing and publishing is an extremely competitive place to be. Staying persistent and focused in your efforts is imperative if you want to succeed. Be a student of the industry. Read and learn everything you can about publishing whether it’s self-publishing or the traditional route you want to take. Learn how to sell if you are not a natural “salesman”. And DO NOT compare yourself to others unless it is a means by which you learn and improve yourself. Make sure you put out a product that you would be willing to purchase yourself. If you wouldn’t buy it, don’t expect your customers to buy it. A few years ago, I only explored the traditional route to publishing. Self-publishing was almost certain career death in the publishing world back then. I sent out many query letters until I finally secured an agent. (It took about a year to find an agent) I went from being in a sea of mega millions, to being in a sea of thousands of new authors hoping to get a contract. In fact, my agent told me that he only accepted less than one per cent of new authors and received over one thousand submissions each week. Gee, I felt special! Needless to say, my agent did not get my book sold and life happened bringing me a new love (children). I retired my writing pursuits for a while until deciding to self-publish. My advice is to do your homework. There are many options now that weren’t available several years ago. I have several opinions about this, but I will say that I agree with a recent comment that I heard. The comment was about book length and what customers are wanting. Book lengths are no longer 70K+ word novels and people are buying shorter books because they don’t have time to read lengthy books. I think it just depends on an individual’s preferences, but a short book that is very well-written will definitely make it to my kindle just the same as a full length novel would.